The family friendly, two star Hotel Thermal, which is almost in the neighbourhood of the thermal bath, has two family rooms and 25 double rooms - some of them can have an extra bed put in. All rooms are equipped with bathroom ( shower / toilet ), television, refrigerator and telephone. Upstairs air- conditioned rooms await our guests. 50 meters from the building we have a bicycle storage in our camping. Breakfast and entry to Brigetio Spa (without sauna entry and only during the time of stay in the hotel). A good equipped camping (opened seasonally) for 200 mobile caravans or tents belongs to the hotel. The direct outdoor route is provided for our guests to the thermal bath with 300 meter walk. The thermal water is rich in minerals, therefore it is suitable for the treatment of musculoskeletal, rheumatic, neurological and gynaecological complaints. Our water is calcium-magnesium-hydrogen-carbonated with chloride and sulphide classified water. Our spa offers two open-air thermal pools (32-38°C), an indoor thermal pool (34-36°C), a jacuzzi (33-35°C), an indoor swimming pool (25-28°C), an indoor training pool (30-33°C), and during the summer season an outdoor swimming pool (22-25°C), an outdoor adventure pool with rainbow chute (25-28°C) and a children’s pool (27-30°C) with entertainment items and a family friendly slide. Kids are welcome by our funny water toys all around the year. Children can enjoy cheerful water toys; a water basketball, a floating island, a cheerful seahorse and an inflatable smiling shark. In the summer heat, both younger and older children can have fun in our children’s pools. These pools are equipped with adventure elements and slides, and offer two different sizes of depth of water. Children can play in two playgrounds, where you can choose from different slides, climbing frames and other fun items. The little archaeologists can find treasures, which can be taken home, from the Roman period in the sandbox. Two Finnish saunas, a log sauna, and an infrared sauna offers refreshment with various essential oils. Our sauna garden evokes the historical past of Komarom. In the garden, the plunge tub, bucket showers, and space for sunbathing makes the sauna experience more complete. Our sauna masters – except for the summer season – indulge our guest with Sauna-séances® all year long. During the séances, the sauna master creates a special atmosphere, so that guests can be refreshed both physically and spiritually. Hotel services: free parking space, bath towel and robe renting. You can rent bicycles or can get discount coupon to our gokart partner. Free wifi is accasseble in our hotel. Cat and dog is not allowed in our hotel. Thank you for understanding! We suggest the following free time activities: swimming and bathing in in the Brigetio Thermalspa of Komárom, visiting the fortress and the museum, taking a walk in the forest and the banks of the River Danube, hiking, gokart, car trips to Tata, Győr, Pannonhalma, Esztergom, Visegrád, Komárno (Slovakia). Relax, rest, get better with us! 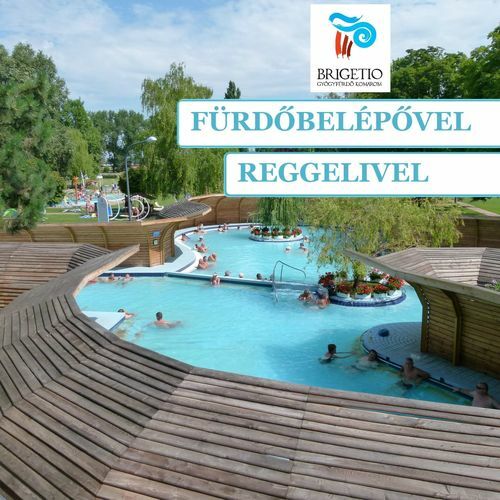 You are welcome by Brigetio Spa of Komárom, which maintains the 1700-year-old bath culture. The rating of Thermál Hotel & Camping Komárom is 9.4 from the maximum of 10, based on 400 real guest reviews. "nemvoltunk tajekoztatva az otani kedvezmenyekrol a komaromi kedvezmeny kartyarol csak utolso nap"
"csendes nyugott , szuper kornyek"
"Személyzet segítőkész, barátságos. Kiváló bőséges reggeli. Jó ár jó elhelyezkedés. Minden a közelben van." "Kifogástalan tisztaság, kedves, figyelmes személyzet - többet nem is kivánhatna az ember." Based on the reviews and comments of actual guests, the services of the Thermál Hotel & Camping Komárom have received a high rating of 9.2/10.